There's just something about eating food on a stick that brings out your inner child-being. Popsicles, corndogs, and cotton candy were kid-favorites, but now that you're an adult, you may have a bit more refined tastes. Kebabs (or kebobs) can satisfy your fun-loving nature and grown-up taste buds. Popular in Turkish cuisine, shish kebabs refers to "gobbets of roasted meat." Traditionally, marinated lamb and seasoned vegetables were threaded on skewers and then grilled over hot coals. However, beef, chicken and seafood may also be used and either roasted or grilled. There are several variations of the shish kebab found around the globe, including satays in Indonesia, which pair meat with a dipping sauce. Pinchos are typically found in Spanish and Latin American cuisine and consist of meat, vegetables and bread served tapas-style on a skewer. In French cuisine, the brochette includes vegetables and meat, most often shrimp. The kebab can be a low calorie, low fat meal since grilling or roasting doesn't require a lot of added oils and fats. Nutritious vegetables aren't forgotten when added to skewers and can add a lot of color and flavor to the meal. Plus, since small pieces of meat are skewered, portions can be easily controlled. Shrimp and scallops are kebab-friendly seafood options. Citrus fruits, including orange, lime or lemon may be paired with seafood or chicken as a flavor booster. 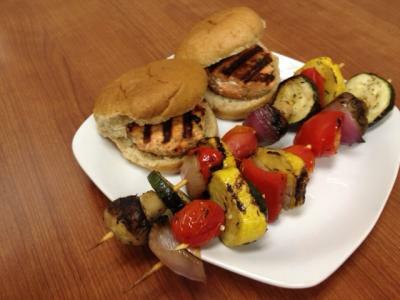 Try making a kebab this summer and be creative with the foods you skewer! If using wooden skewers, soak in water for 30 minutes prior to grilling to prevent charring. Preheat grill to medium-high heat. Wash all vegetables and cut squash, zucchini, pepper and onion into 2-inch chunks or wedges. Place vegetables in a large bowl and add tomatoes and mushrooms. In a small bowl, mix garlic, vinegar, olive oil and thyme. Drizzle over vegetables and toss to coat. Thread vegetables alternately on skewers. Grill kabobs 15-20 minutes, turning occasionally until tender.